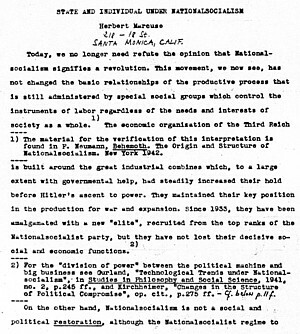 Der hier erstmals in deutscher Sprache auszugsweise dokumentierte Text "State and Individual under National Socialism" wurde 1942 geschrieben, als Marcuse für den US-amerikanischen Nachrichtendienst OSS arbeitete. 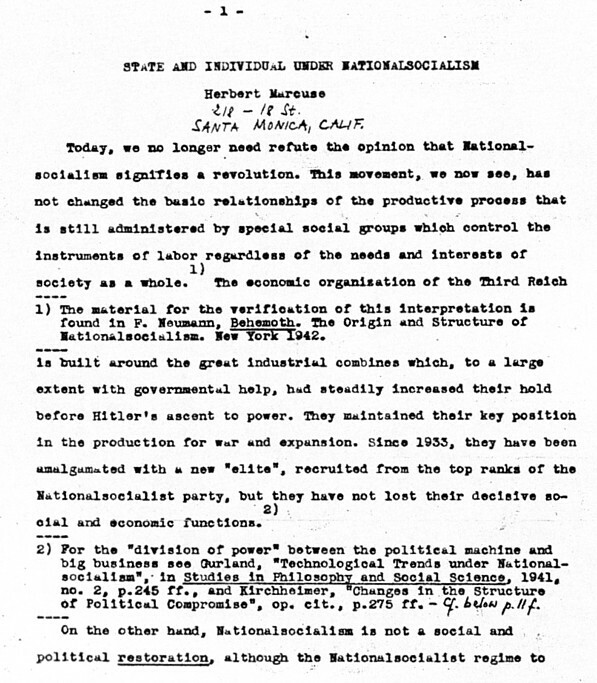 According to Rolf Wiggershaus (1995), this essay was to be included in a book with essays by Gurland, Neumann, Kirchheimer and Pollock, which was, however, never published. The complete original essay is published in: Douglas Kellner, Technology, War and Fascism (New York: Routledge, 1998), 69-88. This excerpt was first published in the German edition of Le Monde Diplomatique in October 2000.